A contemporary creative wordpress theme made for everyone. For designers, artists, photographers or other micro niches. Packed with beautiful portfolio lists and single project layouts, awesome elements, unlimited amazing homepages, lots of practical inner pages, and much more. Itâ€™s Fixa! Fixa Creative Multi Niche WooCommerce WordPress Theme â€“ is an universal theme, for multi niche sites, such as Photographers, Creatives, Bakeries, Zoo Club, Businnes, Freelancers and more.. This WordPress theme comes with lovely design layouts. You can create a magic website, you can play with options and create unlimited variations of your site look. 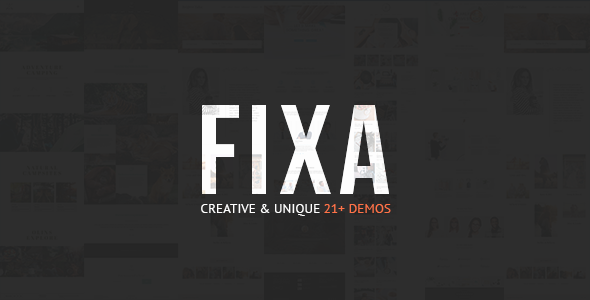 Fixa Theme â€“ is also a photography theme, for people who likes to travel around the world and publish all inspired photos on personal WebSite. This WordPress theme comes with different homepage layouts. You can select your preferred, you can play with options and enable or disable block. Just Drag and Drop items. This awesome theme is the best solution not only for a â€œTravel Photographyâ€, but for any other agencies. You can easy build a website for travel agency, for a hotel, for a yoga center, for a restaurant and much more. You can do everything what you can imagine. Fixa is compatible with popular plugins, as: WPML and qTranslate â€“ for building multilingual portal, WooCommerce â€“ for building e-commerce site, SEO plugins â€“ for better search engine indexing, MailChimp Subscribe â€“ for subscription using MailChimp Service, Social integration â€“ Blog posts Share, Recent Tweets plugin and Facebook Box widget comes with this brilliant theme.